Eye On Tampa Bay: Don't Pay Twice! Stop the Sales Tax Hike Madness June 9th! Don't Pay Twice! Stop the Sales Tax Hike Madness June 9th! Did you think the sales tax hike was sent packing at the public hearing on April 27th? Surprise (or not)! The county commission scheduled a public hearing for June 9th, 6pm at County Center for another sales tax hike public hearing. However, after the last two weeks of commission meetings, who knows what the public is actually supposed to weigh in on at the public hearing. The commissioners first brought back a 1/2% 15 year sales tax almost immediately after they voted NO 4-3 to reject a 20 and 30 year sales tax hike at the April 27, 2016 public hearing. Last week 5 and 10 year sales tax hikes were brought up and also a 1/4 % sales tax hike were brought up. Then at Wednesday's BOCC meeting, Commissioner Miller brought the 20 and 30 year sales tax hike the commissioners previously rejected back on the table. Ridiculous! Makes the commission look foolish and desperate. When asked after the commission workshop Wednesday, County Attorney Chip Fletcher said he was noticing the public hearing generically for a sales tax hike up to 1/2% and no term is included in the notice. Voila! The public can weigh in on any percent of a sales tax hike up to 1/2 percent and for any term. The problem is no one knows what a 5, 10, 15 year sales tax funds or what a 1/4% sales tax funds. When asked after the commission workshop Wednesday what transportation plan do all these sales tax hike iterations fund, County Administrator Mike Merrill simply said the plan is the plan. How can that be? At last weeks BOCC meeting Merrill stated the streetcar and the Brandon and South County taj mahal BRT's would be funded in the 15 year sales tax hike. At Wednesday's workshop meeting Merrill stated they would not be in the 15 year sales tax hike. So what's in and what's out? No one knows but the commissioners are expecting the public to weigh in on something. Now it is 2 weeks before another sales tax hike public hearing already scheduled and all these iterations of a sales tax hike are up for grabs. Why weren't they discussed during the Policy Leadership Group meetings? Wasn't Parsons Brinckerhoff supposed to vet all the funding options with the public? We (taxpayers) paid the Parsons/Leytham team $1.35 million to do public engagement that included an entire phase on funding options. That was simply for show because the Parsons/Leytham team came back with the only solution they were directed to come back with - another 30 year sales tax hike boondoggle. No true consultant ever comes back to their client with only one take it or leave it solution. Real consultants always provide several alternatives for their clients to consider. Using taxpayer money for a campaign to increase taxes against the taxpayer is called electioneering. If that is not illegal, it is unethical and not being honest brokers with the public. So here we are almost to June and now the commissioners are wanting to discuss other funding options than a 30 year sales tax hike boondoggle. Will there finally be an honest discussion about using the growth of our existing budget first to fund our roads and transportation needs? We hope so. The reality is there is no transportation plan. The county just has a laundry list of projects. In the meantime, this second public hearing looks more like a desperation attempt by the sales tax hike and spend collaborators. This commission must start funding our highest priorities first within our existing growing budget! 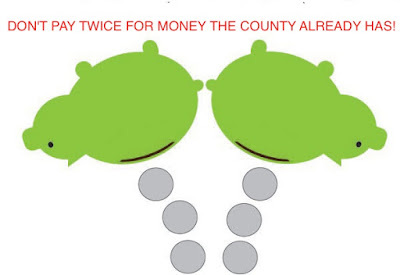 As we posted here, the county has money. Taxpayers should not be asked to raise their sales tax for money the county already has. We do not want to pay twice. That would simply create a county slush fund for spending on who knows what. Show up on June 9th, 6pm, at the public hearing at County Center. Stop the sales tax hike madness once and for all.